All summer long, the garden tomatoes have ripened one or two a day – making an easy pluck, enough for a sandwich or a salad or an ingredient for dinner. Now as the end of the season comes to a close, the bushes have reached their relaxed state of exhaustion. They are leggy, bald in some spots from clipping and pruning and dry in others from months beneath the hot Georgia sun. For all that they lack in fine appearance, a curious event has been occurring over the past week or so. Suddenly, it seems, the last little stragglers have joined together for one last hearty attempt to grow, ripen and red in abundance. Over the weekend, Ms. Jeannie pulled 18 ripe tomatoes from her vines, with about 15 more “in the hopper” so to say that will be ready in the next couple of days. My goodness! Their efforts seem valiant! 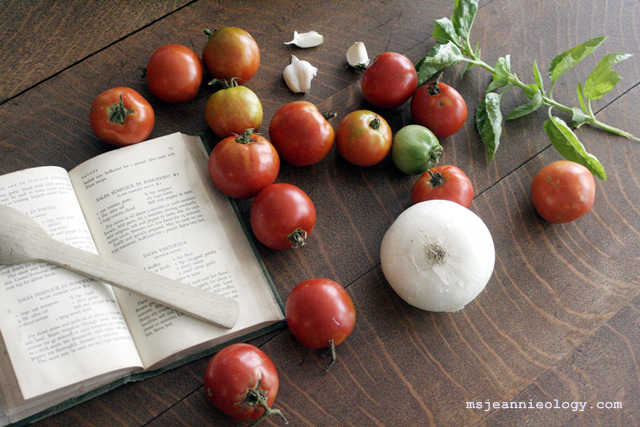 Armed with her big basket full of beauties and under the spell of a cool rainy Saturday, it seemed to Ms. Jeannie like the perfect time to make a new recipe from an old cookbook. 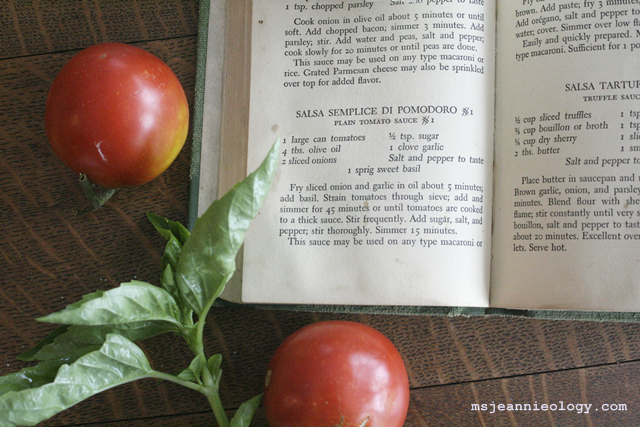 The recipe is Salsa Semplice Di Pomodoro #1, otherwise known as Plain Tomato Sauce #1 from the Art of Italian Cooking by Maria Lo Pinto, circa 1948. The cookbook is great. Hardcover, spotted, penciled, appreciated – every time she opens the cover, Ms. Jeannie feels like she is communicating with a dozen different women before her. Their notes, their stains, maybe some sweat and tears all marked there on the pages. The author, Maria, bound all these recipes together because her friends kept asking how she did that, and this and that and this, again and again. 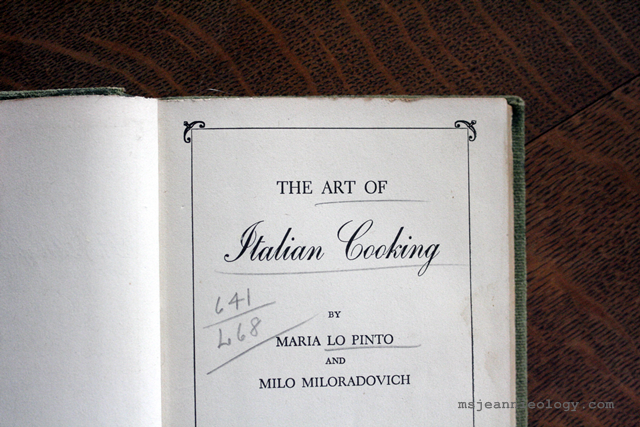 Just like the cookbook endeavor of the women of St. Paul’s Greek Orthodox Church, the recipes contained in the Art of Italian Cooking have been passed down in Maria’s family for generations. Tried and true Italian, at it’s best! This is a really simple recipe with just 7 ingredients, which include basil, another overzealous grower in Ms. Jeannie’s garden! The recipe called for canned tomatoes, so Ms. Jeannie actually added a little bit of extra work to the whole affair by using fresh, but really that just meant a little bit of extra time preparing the tomatoes in a hot water bath. So you could make this recipe either way depending on the amount of time you have. The hot water bath is easy – you just boil a big soup pot full of water and once it starts bubbling drop your tomatoes in the water and let them bob about for 4-5 minutes. You’ll see the skins start to wrinkle and burst. When that happens, they are ready to come out. 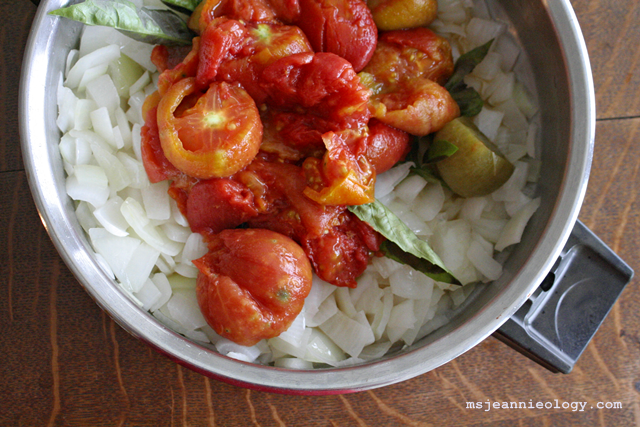 While the tomatoes are bobbing about you can chop the onions and garlic. 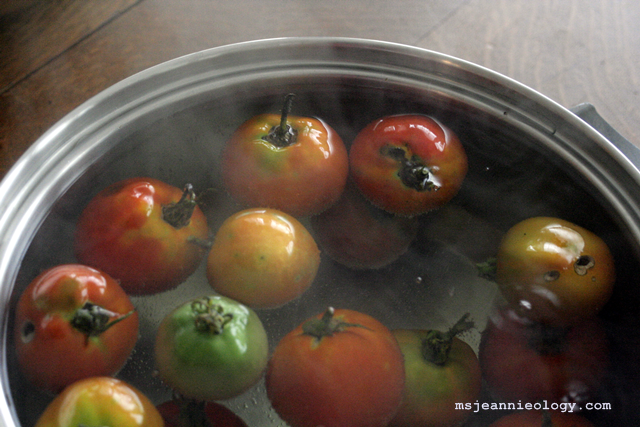 When the the wrinkles appear, lift each tomato from the bath (Ms. Jeannie likes to use a slotted spoon so that the excess water drains) you can put the tomatoes in a strainer to let them cool off a bit. 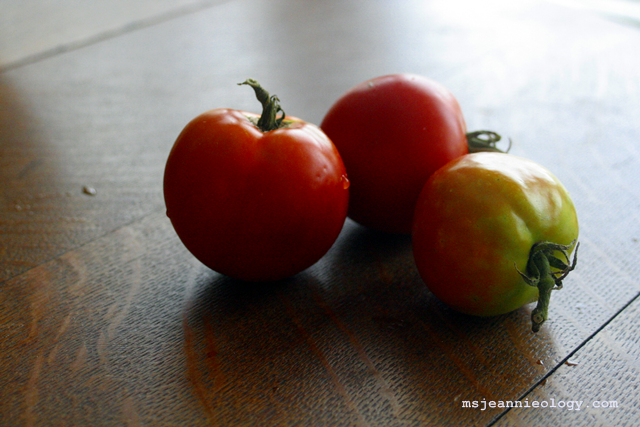 Once cool enough to touch, you just peel the loose skin from the tomato, cut off any blemishes or spots and then set the tomatoes aside in a bowl. Next, warm the olive oil in a saute pan, add the onions and garlic, saute for 5 minutes and then add a sprig of basil and the tomatoes and sort of mash the tomatoes up with a wooden spoon in the pan. Simmer the whole pot on low for 45 minutes, stirring often. Next add the sugar and salt and pepper. Simmer for another 15 minutes and then it is ready! This batch makes about 3 cups of sauce (maybe a little more or a little less depending on the size of your tomatoes). According to the recipe it is enough for 1 lb. of pasta. The consistency is thick with big chunks of tomato and onion, which works well with either a small pasta (shell, bow-tie, ziti) or the traditional spaghetti or fettuccine. At the last minute, Ms. Jeannie decided to add two tablespoons of tomato paste and a cup of water, so that she would have enough sauce for an Eggplant Parmesan recipe she is going to try in October. After simmering for another 15 minutes, those two additions increased the yield to 4 cups of sauce. The great thing about this recipe is that you can tweak it however you like – add olives or mushrooms, oregano or a dash of red wine. In the introduction of the book, Maria encourages any and all experimenting – as she states – all these recipes are simple foundations of Italian cuisine – you can build up from them according to your palette. Right now, it is still too warm for a heavy baked Italian dish, so Ms. Jeannie is freezing her batch. It is always seems fun to pull out little reminders of the summer garden when you are well into another season. The next harvest challenge that needs to be tackled is the basil. Ms. Jeannie has plans to dry some and make a batch of pesto but there will still be lots to use before it starts going to seed, so if you have any suggestions please comment below! Fry sliced onion and garlic about 5 minutes in oil. Add basil. 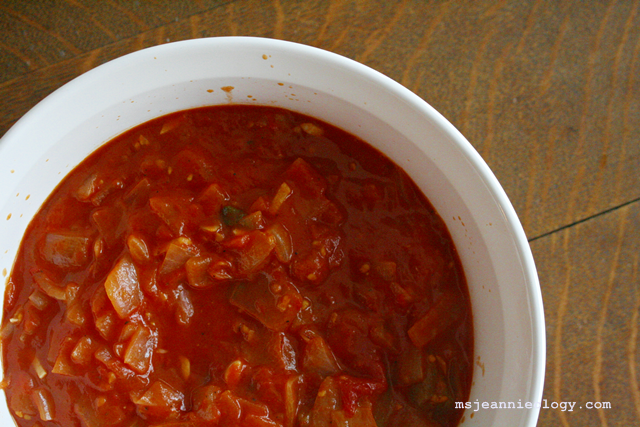 Strain tomatoes through sieve; add and simmer 45 minutes or until tomatoes are cooked to a thick sauce. Stir frequently; add sugar, salt and pepper, stir thoroughly. Simmer 15 minutes. This sauce may be used on any type of macaroni or boiled rice. Sufficient for 1 pound. Also used with pizza recipe. Mangia, dear readers! If you are unfamiliar with that expression, it means eat, in Italian! Next Ms. Jeannie Goes to Hollywood!